Julien Guillaumin, DVM, DACVECC, DECVECC, is an associate professor of emergency medicine and critical care at The Ohio State University. He earned his DVM from National Veterinary School of Nantes in Nantes, France, and completed a small animal rotating internship at National Veterinary School of Alfort in Maisons-Alfort, France. Dr. Guillaumin completed a residency at University of California, Davis, and serves on the American College of Veterinary Emergency Critical Care residency training committee and the European College of Veterinary Emergency and Critical Care education committee. His clinical interests are hemostasis, blood banking and blood products, immune-mediated hemolytic anemia, thrombosis, and systemic inflammatory response syndrome, sepsis, and multiple organ dysfunction syndrome. Corticosteroids are indicated for many medical conditions, including immune-mediated diseases (eg, immune-mediated thrombocytopenia, immune-mediated hemolytic anemia) or anaphylaxis, but may be contraindicated in certain situations or may precipitate adverse events. Corticosteroids are also contraindicated in cases of congestive heart failure, diabetic ketoacidosis, and wound healing. The decision to use corticosteroids in high-risk patients is often made on a case-by-case basis. The following quiz presents 8 high-risk cases in which corticosteroids may or may not be indicated. Take this quiz by answering the following multiple choice questions. 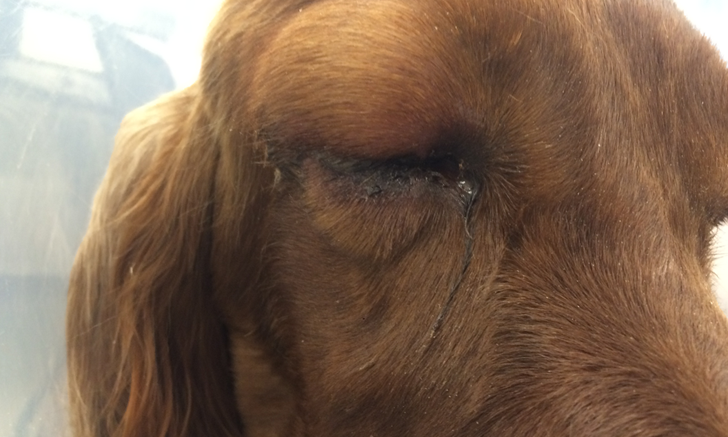 Nala, a 30 kg, 6-year-old spayed female Irish setter, is presented with severe facial swelling, attributed to an anaphylactic reaction to a vaccination. She receives 17 units of NPH insulin twice a day to manage diabetes mellitus diagnosed 2 years prior. Her diabetes has been challenging to control, and she suffered a diabetic ketoacidosis crisis 6 weeks prior to presentation. Physical examination reveals periocular bilateral facial swelling (Figure 1). Spot glucose measurement obtained on admission is 401 mg/dL. An association between chronic administration of corticosteroids and diabetes mellitus has been suggested in dogs. However, it is unknown if one short-acting corticosteroid injection, which would be appropriate for this patient, would push this patient into another diabetic ketoacidosis crisis. An example of short-acting corticosteroid includes dexamethasone sodium phosphate at an anti-inflammatory dose (0.1 mg/kg IV). The owner should be warned that diabetic ketoacidosis crisis may be a possibility. Select one of the above choices and click submit. Taurus, an 8-year-old neutered male domestic shorthair cat, is presented as an emergency for a 24-hour history of dyspnea. He has been treated with oral prednisolone at 2 mg/kg q24 hours for the past 6 months for diagnosed immune-mediated hemolytic anemia (IMHA). Initial physical examination reveals a grade III/VI heart murmur and bilateral pulmonary crackles. In addition to a full workup and treatment for congestive heart failure, which would be the best corticosteroid therapy recommendation for Taurus? Continue the course of corticosteroid therapy. Taper the corticosteroid therapy over the next 6 months. Taper corticosteroids over 2-3 days and switch to a different immunosuppressant. Immediately discontinue corticosteroid therapy without tapering. The correct answer is C. Corticosteroids have been associated with new onset congestive heart failure in both humans and cats,6,7 so option A is incorrect. The most appropriate choice is to taper the corticosteroid over the course of a few days. Current recommendations for stopping corticosteroid treatment include tapering the dose over a few days to prevent adrenal crisis and allow the hypothalamic–pituitary–adrenal axis to adapt to the decrease in exogenous corticosteroids. 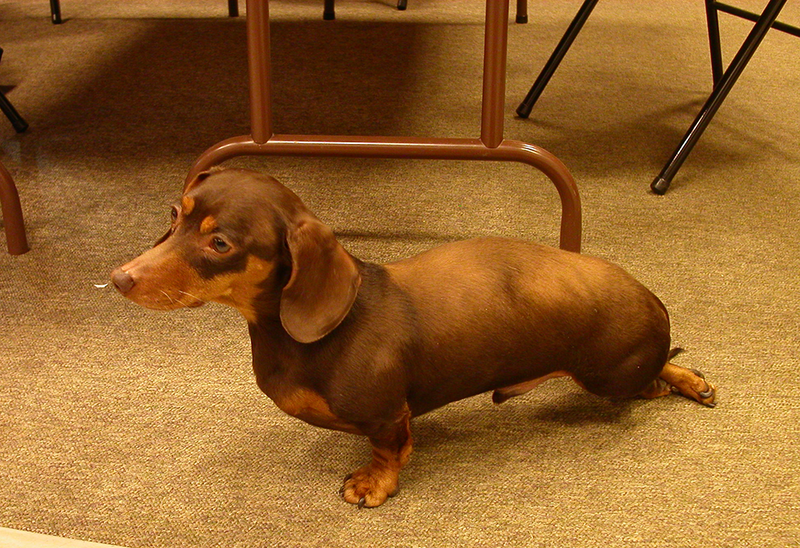 Frank, a 10-year-old neutered male dachshund, is presented with pelvic limb ataxia of one week’s duration. Frank had been seen by another veterinarian 4 days prior to presentation and was administered a course of deracoxib (2 mg/kg PO q24h), but neurological deficits worsened. A general physical examination is unremarkable. A neurologic examination is suggestive of an ambulatory T3-L3 myelopathy with spinal hyperpathia. Is initiation of corticosteroid therapy recommended for Frank? Yes, the combination of corticosteroids and NSAIDs may be beneficial for this patient. Yes, but only after stopping deracoxib and waiting 7 days for a washout period. No, corticosteroid therapy is not recommended. 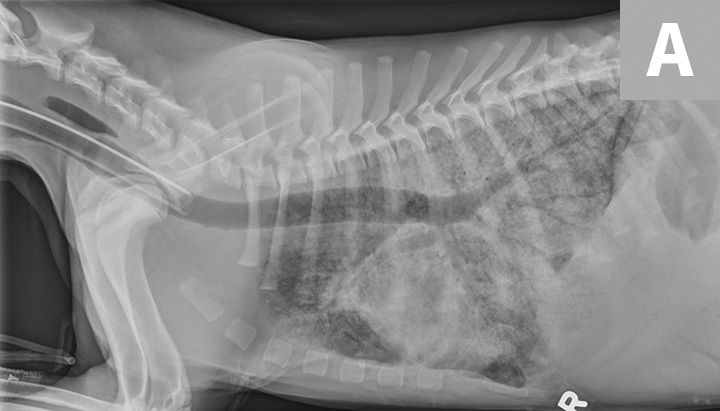 The correct answer is C. The combination of NSAIDs and corticosteroids has been shown to be detrimental to the GI system and may lead to gastric ulceration in both dogs and humans.8,9 Option B is also not appropriate, as it has been shown that NSAID use reduces the risk for recurrence of presumed thoracolumbar intervertebral disk disease in ambulatory dogs with spinal hyperpathia as compared with corticosteroids.10 In addition, waiting 7 days for a washout period is also not advised in this patient. Advanced imaging and surgical management should be discussed with the owner, as worsening of clinical signs despite appropriate medical management is considered a surgical indication by many neurologists. NSAID therapy can be continued for post-operative pain management. Abner, a 4-year-old neutered male mastiff, is referred for severe thrombocytopenia (platelet count 2,000/μL) and presumptive severe GI bleeding. Physical examination reveals mild hypovolemic shock and severe melena. Regenerative nonhemolytic anemia at 17% hematocrit is also identified. 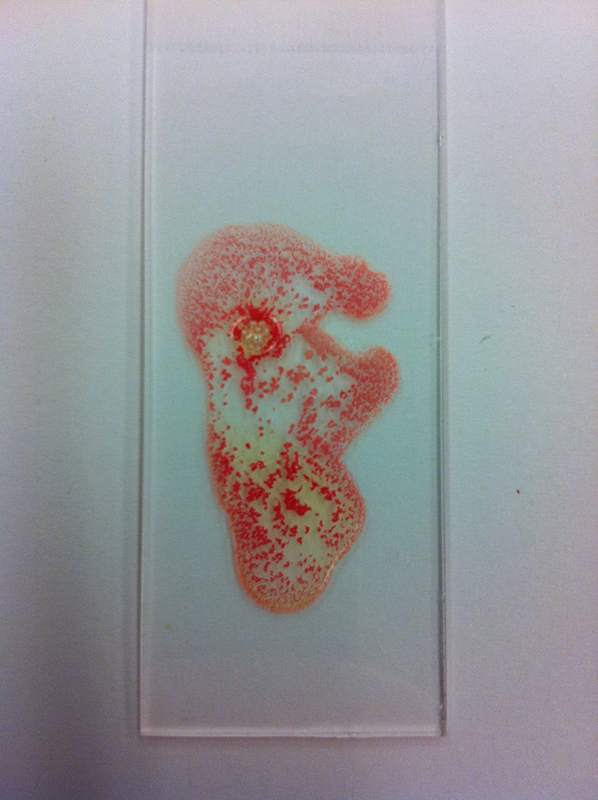 Immune-mediated thrombocytopenia (ITP) associated with severe gastric bleeding is suspected. Which of the following is most accurate? Corticosteroids should be used in this patient, but only at doses providing anti-inflammatory effects. Corticosteroids should be used to treat this patient’s ITP in conjunction with gastroprotectants to support the GI system. Corticosteroids should be used to improve this patient’s gastric bleed, as corticosteroids are important for GI health. Corticosteroids are contraindicated because of the risk of worsening the GI bleed; another immunosuppressant should be used. Despite blood transfusion, the patient’s health declined, and he was ultimately euthanized. 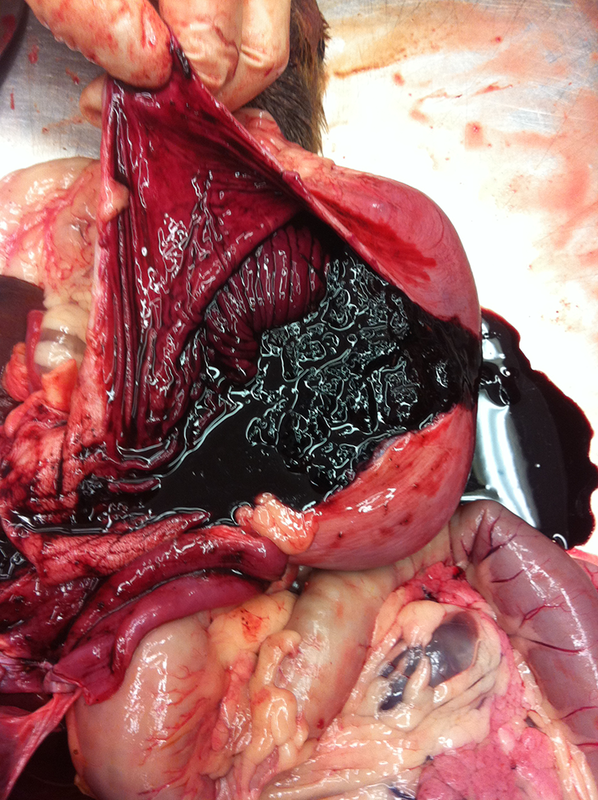 Autopsy revealed severe, diffuse gastric erosion; bleeding and ulceration; and a large amount of gastric blood loss (Figure 4). 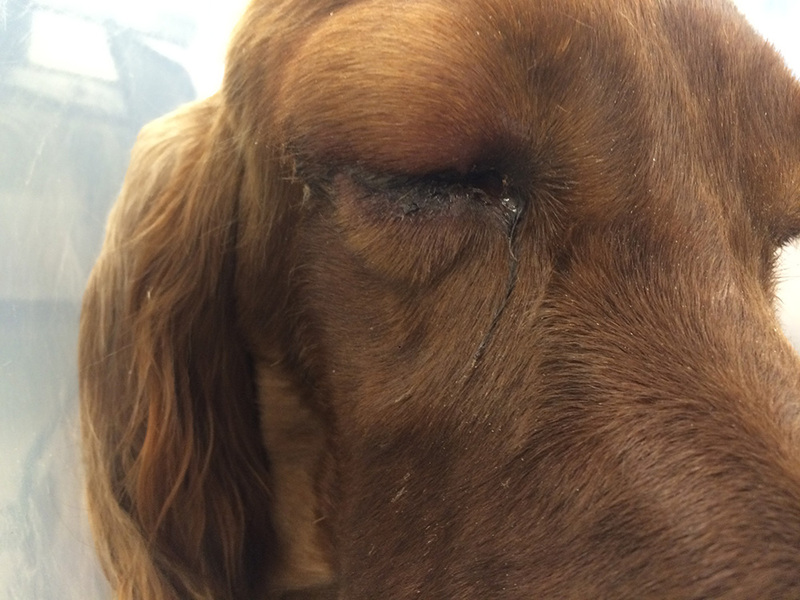 Liza, a 10-year-old spayed Irish setter, is presented for jaundice and lethargy of a few days’ duration. She has been treated for several years with carprofen and gabapentin for chronic hip dysplasia and severe osteoarthritis. After examination, she is diagnosed with severe IMHA. Corticosteroids at doses that provide immunosuppressive effects are indicated in this patient. Carprofen should be discontinued and corticosteroids started immediately. Aggressive therapy should also be initiated for GI support. Corticosteroids are indicated in this patient. Carprofen should be immediately discontinued, with a washout period of 3-4 days before beginning corticosteroids. Another immunosuppressant should be used as a bridge. Carprofen and corticosteroids can be administered simultaneously, provided an H2-blocker (eg, famotidine) is used concurrently. 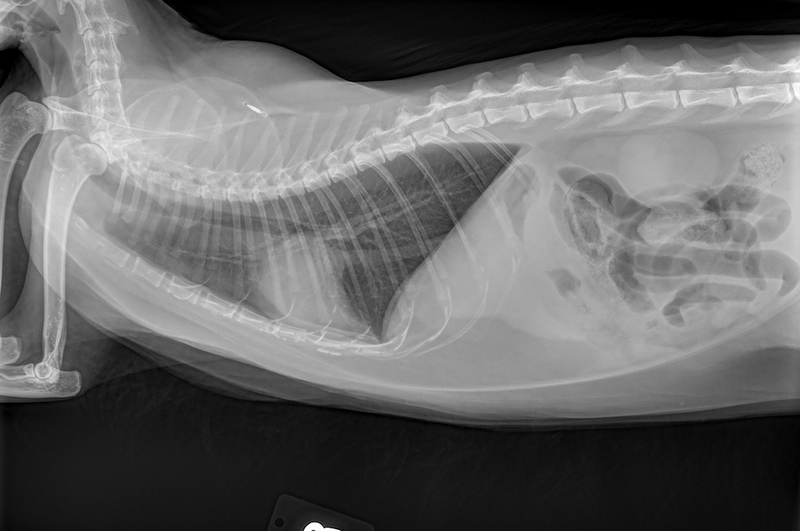 Greta, a 6-year-old spayed cat with a 2-year history of well-controlled diabetes mellitus, is presented in respiratory distress. A mild cough of several months’ duration worsened in the week prior to presentation and dyspnea developed 2 days before presentation. Physical examination reveals marked to severe respiratory distress with severe bilateral expiratory wheezes. Given the association between corticosteroids and diabetes mellitus, are corticosteroids recommended to stabilize this patient? The correct answer is A. Because the patient is in respiratory distress with presumed asthma, stabilization is crucial. Short-acting corticosteroids (eg, dexamethasone, dexamethasone sodium phosphate) should be used with bronchodilators. Because use of both inhaled and systemic corticosteroids has been associated with diabetes,1-2,19 short-acting corticosteroids can be administered after discharge, but the cat’s diabetes mellitus should be closely monitored with at-home blood and urine spot-checks. 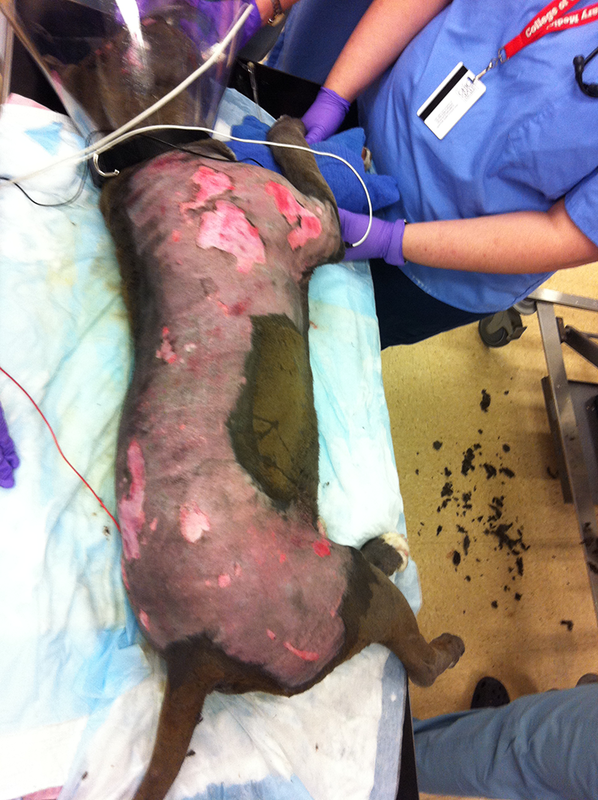 Caesar, a 2-year-old intact male pitbull, is presented with severe burns from boiling oil (Figure 7). Three days after his first presentation, Caesar develops systemic hypotension refractory to fluid therapy. Septic shock is suspected and antibiotics are initiated, but the patient’s blood pressure continues to decrease despite increased doses of norepinephrine and vasopressin. Critical illness-related corticosteroid insufficiency (CIRCI) is a concern in this patient, but, because corticosteroids are known to impair wound healing, should CIRCI treatment be withheld in this case? Jersey, a 12-year-old spayed crossbreed dog, is presented as an emergency after becoming suddenly dyspneic after an episode of acute vomiting. She is diagnosed with aspiration pneumonia, but her hypoxemia is not responsive to oxygen. She is intubated and mechanical ventilation is initiated. Acute respiratory distress syndrome (ARDS) is diagnosed based on thoracic radiographs (Figure 8). Is it likely that using corticosteroids for ARDS will worsen Jersey’s infection? The correct answer is B. Therapy should be focused on ARDS treatment. Low doses of corticosteroids (eg, methylprednisolone [1 mg/kg/day]) are recommended in humans with moderate to severe ARDS.16-17 At this dose in veterinary patients, it is unlikely that the negative impact on the infection will outweigh the benefits of corticosteroids. Gulliford MC, Charlton J, Latinovic R. Risk of diabetes associated with prescribed glucocorticoids in a large population. Diabetes Care. 2006;29(12):2728-2729. Clore JN, Thurby-Hay L. Glucocorticoid-induced hyperglycemia. Endocr Pract. 2009;15(5):469-474. Jeffers JG, Shanley KJ, Schick RO. Diabetes mellitus induced in a dog after administration of corticosteroids and methylprednisolone pulse therapy. J Am Vet Med Assoc. 1991;199(1):77-80. Campbell KL, Latimer KS. 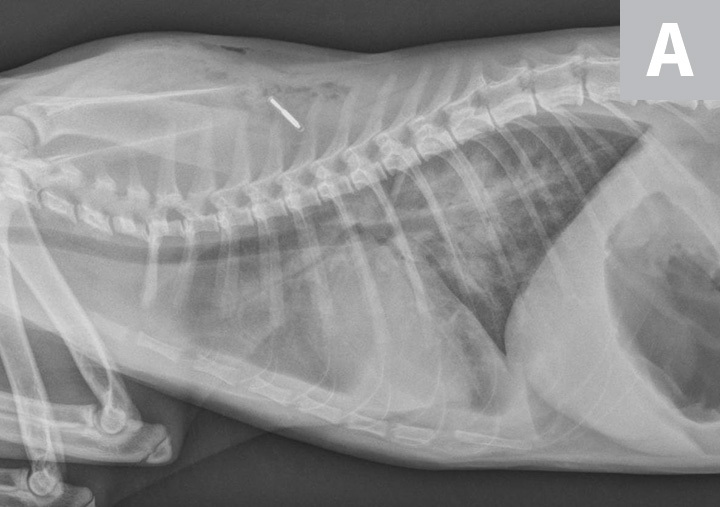 Transient diabetes mellitus associated with prednisone therapy in a dog. J Am Vet Med Assoc. 1984;185(3):299-301. Edwards DF. Transient diabetes mellitus and ketoacidosis in a dog. J Am Vet Med Assoc. 1982;180(1):68-70. Wei L, MacDonald TM, Walker BR. Taking glucocorticoids by prescription is associated with subsequent cardiovascular disease. Ann Intern Med. 2004;141(10):764-770. Smith SA, Tobias AH, Fine DM, Jacob KA, Ployngam T. Corticosteroid-associated congestive heart failure in 12 cats. Intern J Appl Res Vet Med. 2004;2(3):159-170. 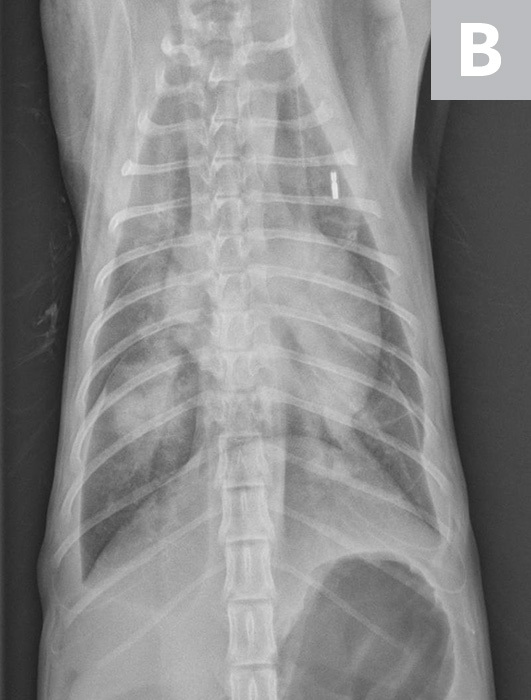 Lascelles BD, Blikslager AT, Fox SM, Reece D. Gastrointestinal tract perforation in dogs treated with a selective cyclooxygenase-2 inhibitor: 29 cases (2002-2003). J Am Vet Med Assoc. 2005;227(7):1112-1117. Garcia Rodríguez LA, Hernández-Díaz S. The risk of upper gastrointestinal complications associated with nonsteroidal anti-inflammatory drugs, glucocorticoids, acetaminophen, and combinations of these agents. Arthritis Res. 2001;3(2):98-101. Mann FA, Wagner-Mann CC, Dunphy ED, Ruben DS, Rochat MC, Bartels KE. Recurrence rate of presumed thoracolumbar intervertebral disc disease in ambulatory dogs with spinal hyperpathia treated with anti-inflammatory drugs: 78 cases (1997-2000). J Vet Emerg Crit Care. 2007;17(1):53-60. Narum S, Westergren T, Klemp M. Corticosteroids and risk of gastrointestinal bleeding: a systematic review and meta-analysis. BMJ Open. 2014;4(5). Williamson KK, Willard MD, Payton ME, Davis MS. Efficacy of omeprazole versus high-dose famotidine for prevention of exercise-induced gastritis in racing Alaskan sled dogs. J Vet Intern Med. 2010;24(2):285-288. Wicke C, Halliday B, Allen D, et al. Effects of steroids and retinoids on wound healing. Arch Surg. 2000;135(11):1265-1270. Rhodes A, Evans LE, Alhazzani W, et al. Surviving sepsis campaign: international guidelines for management of sepsis and septic shock: 2016. Crit Care Med. 2017;45(3):486-552. Annane D, Pastores SM, Rochwerg B, et al. Guidelines for the diagnosis and management of critical illness-related corticosteroid insufficiency (CIRCI) in critically ill patients (part I): Society of Critical Care Medicine (SCCM) and European Society of Intensive Care Medicine (ESICM) 2017. Crit Care Med. 2017;45(12):2078-2088. Pastores SM, Annane D, Rochwerg B. Guidelines for the diagnosis and management of critical illness-related corticosteroid insufficiency (CIRCI) in critically ill patients (part II): Society of Critical Care Medicine (SCCM) and European Society of Intensive Care Medicine (ESICM) 2017. Crit Care Med. 2018;46(1):146-148. Aharon MA, Prittie JE, Buriko K. A review of associated controversies surrounding glucocorticoid use in veterinary emergency and critical care. J Vet Emerg Crit Care (San Antonio). 2017;27(3):267-277. Pandya D, Puttanna A, Balagopal V. Systemic effects of inhaled corticosteroids: an overview. Open Respir Med J. 2014;31(8):59-65.